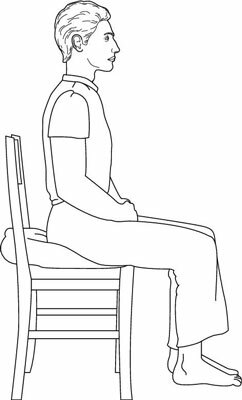 Which Posture Should You Use for Mindfulness Sitting Meditation? When sitting for mindfulness meditation, imagine yourself as a mountain: stable, grounded, balanced, dignified and beautiful. Your outer posture is more likely to be translated in your inner world, bringing clarity and wakefulness. Sit on a chair or on the floor, in any posture, as long as you can sit with your back as straight as you can manage. Ensure that your hips are several inches above your knees by sitting on a cushion or pillow. This helps to straighten your back, which keeps you more aware, awake and mindful. In a quest for comfort, you may have become accustomed to slouching on chairs. Over time, slouching causes damage to your back. When you sit away from the back of the chair and support your own weight, you’re making a statement to yourself: ‘I’m making an effort to meditate. I’m supporting myself.’ Making this statement tends to have a positive effect on the meditation itself. Try putting a couple of magazines, wooden blocks or perhaps even telephone directories underneath the back two legs of the chair. By giving your chair a slight tilt forwards you help to make your back straight naturally, without much effort. Place your feet flat on the floor, or on a cushion on the floor if the chair is too high. Your knees need to be at more than about ninety degrees so that your hips are above your knees. Position your hands on your knees face down, face up or place your hands in each other. If your hands are facing up, you may find it comfortable to allow your thumbs to gently touch each other. Some people also like to allow the hands to rest on a small cushion on their legs to prevent the shoulders dragging downwards. Imagine that your head is a helium-filled balloon. Allow your head to lift naturally and gently and straighten your spine without straining. You want to achieve an upright back without tension. Picture the vertebrae as stacked coins. Tuck in your chin slightly. Lean forwards and backwards a few times until you find the middle balance point – at this position your head neither falls back nor forward but is naturally balanced on the neck and shoulders. Then lean to the left and right to find the point of balance again. Now relax any extra tension in the body. You’re ready to meditate! You can also do seated meditation sitting in the more traditional posture on the floor. Some people find sitting on the floor more grounding and stable. However, sitting in the most comfortable posture for you is more important than anything else. 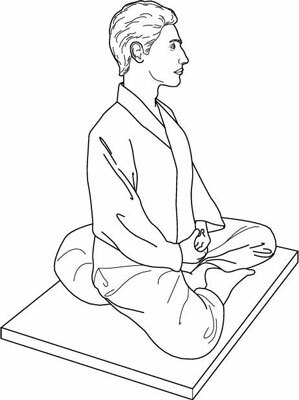 On the floor, you can do the kneeling posture, in which you support your buttocks using a meditation stool or a cushion. If you use a meditation stool, ensure that you have a cushion for it too, or you may find it uncomfortable. It’s important to find a stool or cushion at the right height for you. Too high and your back will feel strained and uncomfortable. Too low and you’re more likely to slump and feel sleepy. Begin by shaking your legs, and rotating your ankles to prepare yourself for the posture. Kneel on a carpet or mat on the floor. Raise your buttocks up and place the kneeling stool between your lower legs and your buttocks. Gently sit back down on the kneeling stool. Place a cushion on top of the kneeling stool if you haven’t already done so, to make the posture more comfortable for yourself. Shift your body around slightly to ensure you’re in a posture that feels balanced and stable for you. You don’t need to be overly rigid in your posture. 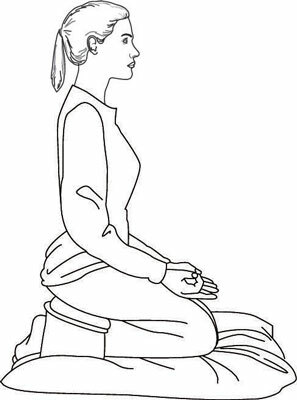 The other position is the Burmese posture. This simply involves sitting on a cushion, and placing both lower legs on the floor, one folded in front of the other. Shake your legs, rotate your ankles and have a stretch, however feels right for you. This helps to prepare your body to sit. Place a mat or soft blanket on the ground. On top of that, place a firm cushion, or several soft cushions on top of each other. Sit down by placing your buttocks on the cushion. Allow your knees to touch the ground. If your knees don’t touch the ground, either use more cushions or try a different posture. Allow the heel of your left foot to be close to or to gently touch the inside thigh of your right leg. Allow the right leg to be in front of the left leg, with the heel pointing towards your lower left leg. If your legs aren’t that supple, adjust as necessary, always ensuring you’re comfortable. Invite your back to be quite straight but relaxed too. Gently rock back and forth to find the point where your head is balanced on your neck and shoulders. Tuck your chin in slightly, so the back of your neck isn’t straining. Place your hand on your knees facing down, or up with thumb and first finger gently touching. Alternatively, place a small cushion in your lap, and place your hands on the cushion in any way that feels right for you. Meditate to your heart’s content. You’ll find it more comfortable to sit on a firm meditation cushion, often called a zafu. Ordinary cushions are too soft. Alternatively, use lots of small cushions or fold a large cushion to give you better support. Find a position you’re happy with.